Federal prosecution usually targets cases where police seize a large quantity of controlled substances, or conspiracies against drug trafficking networks involving many defendants that have operated for long periods of time. Conspiracy law favors the Government: A defendant need only have a slight connection to the drug trafficking scheme to be charged as a member of the conspiracy. That creates a real risk that an individual charged in a large conspiracy case may be found guilty based solely on evidence of what other “co-conspirators” said and did. 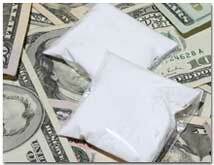 See jury instructions in a federal drug conspiracy case here. Harsh, mandatory-minimum prison sentences—ranging from 5 years up to life imprisonment—are triggered by the quantities of drugs involved, and increased based on a defendant’s prior felony drug convictions. See 21 U.S.C. §841. If you are charged in a federal drug trafficking or drug conspiracy case—even as a first offender—you are in serious trouble. See chart of Federal Drug Crime Sentences for some of the more common drug types. Attorney Terri Wood has successfully defended people charged with federal drug crimes since 1989. For more information, call her at (541) 484-4171. Rest assured that if you must leave a message, your call will be returned by Attorney Wood, not a receptionist or associate. Personalized attention to you and your case is guaranteed.